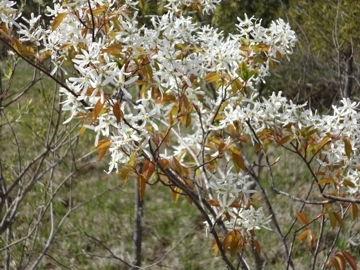 The little, white flowering trees blooming in our forests about this time of year are serviceberry, or Amelanchier. Going south on highway 131 the proliferation of blooming trees often looks like snow in the forest. Also known as the shadblow, the serviceberry are the first trees to bloom in spring, usually along with forsythia. Unlike the forsythia, they are native. The name serviceberry has two possible derivation legends. One is a corruption of ‘sarvisberry,’ a name the Romans gave to the sorbus, or European mountain ash. Early American settlers noticed the Amelanchier’s fruit resembled the berries of the sarvisberry. The other comes from folklore. Early settlers saw the blossoming of serviceberry as the proper time to inter bodies held during the winter, or because travel was too difficult during winter to attend funeral services, so a memorial service was held when the serviceberry bloomed. The name shadblow comes from its bloom time concurring with the annual migration of shad in eastern rivers. In June, the serviceberries produce red berries that ripen to deep blue, which gives the Amelanchier another common name, juneberry. Settlers prized the fruit for making jam, but because they are easily bruised and keep poorly, they have never made it into the food production industry. To collect berries from the wild you have to beat the Robins, Cedar Waxwings, and other birds and many mammals to them, not an easy task, so few of us have tasted juneberry jam. If you come across ripe wild serviceberry fruits, try them, for they are delicious, with a hint of pear flavor. Serviceberries are members of the rose family, and if you look closely at the flower, you will see a disheveled resemblance to wild roses. The branches hold their five-petaledl white flowers in disordered groups and even the petals might not all match in length. About six species grow in Michigan, but these plants hybridize very easily, so species identification can be next to impossible. Because they are an understory tree, or trees that live beneath the shade of taller trees, you can expect serviceberries to be small, usually less than twenty feet. There are also serviceberries that grow as small shrubs. Most serviceberries are hard to find under cultivation, perhaps because some tend to sucker and spread, particularly in the shrub group like the roundleaf serviceberry, A. sanguinea. The Amelanchier grandiflora is a hybrid and grown as a specimen tree sometimes called the apple serviceberry. This hybrid is better behaved than its wild cousins, less prone to suckering and produces larger flowers. Amelanchier are very tolerant and adaptable to many growing conditions. Their natural habitat is partial shade, but many grow in full sun. They can tolerate dry soil and drought once established. They are not prone to breaking limbs by strong winds and storms. Because of their rose relationship, they might get fire blight disease, but this is usually due to over fertilizing. Amelanchier are hardy, small trees. With their early spring bloom, summer fruit, and great fall color, they provide multiple seasons of interest and make a perfect tree for small gardens or yards.